It appears likely that incumbent Iraqi prime minister Nuri al-Maliki will retain his position, much to the dismay of myself and other observers who favor Dr. Iyad 'Alawi. Although 'Alawi's secular 'Iraqiyah slate won a few more seats in the elections held seven months ago, 'Alawi has not been able to form a government. With recent Kurdish support for al-Maliki, it appears that the Iraqis (and the United States) will be saddled with al-Maliki for another term. Before I go into this, I should declare my background with the Kurds. I was part of a CIA operation that provided support to the Kurds in northern Iraq in 1995 and 1996. During that time, I worked closely with both the Kurdish Democratic Party (KDP) under Mas'ud Barzani, and the Patriotic Union of Kurdistan (PUK) under Jalal Talabani. Talabani is the current president of Iraq, and Barzani is the president of the Iraqi Kurdistan Region, an autonomus region as provided in the Iraqi constitution. I also worked with another senior Kurdish official, Hoshyar Zebari, now Iraq's foreign minister. I believe that the Kurds have legitimate concerns that should be addressed. That said, I am not pleased with the decision to support al-Maliki over 'Alawi. I think 'Alawi is the better choice to unify the Iraqis, be they Sunnis, Shi'a or Kurds. Al-Maliki will simply continue the policies that most Sunnis believe are exclusionary to them. Unfortunately, the Kurdish support will easily give al-Maliki the seats he needs to form a new government. To gain Kurdish support, al-Maliki has committed in turn to support the Kurds' demands for the return of lands they were forcibly removed from during Saddam Husayn's "Arabization" (t'arib) campaign of the 1980's. In this campaign, entire Kurdish villages were relocated to the deserts of southern Iraq and replaced with ethnic Arabs. The most notable loss for the Kurds was what they believe is the Kurdish city of Kirkuk. The Kurds consider Kirkuk to be their true capital city. Such an arrangement between al-Maliki's political bloc and the Kurds is sure to inflame the Sunnis all over Iraq and the Turkmens residing in Kirkuk. The Turkmens consider Kirkuk to be a Turkmen city, and are supported in this claim by the Turkish government. The Sunnis will continue to feel disenfranchised, believing that the Shi'a and Kurds, both of whom were repressed under Sunni-majority Ba'th Party rule, have joined forces against them. The cooperation between the Kurds and al-Maliki is not a unifying strategy for the country, but the Kurds are more interested in their own future than that of Iraq. While most Kurds favor the creation of an independent Kurdistan, most also realize the chances of that happening are virtually non-existent. They are making the best of the situation. It is hard to blame them. As is often said to describe the Kurds, "no friends but the mountains." Not only will another term for Nuri al-Miliki continue the rifts between the Sunni and Shi'a, and between the Sunnis and Kurds, but it also raises concerns about Iranian influence in Iraqi affairs. Political pundits in Baghdad have referred to al-Maliki as al-maliki al-irani, "al-Maliki the Iranian," and to his office as "the Persian carpet." It gets better. Al-Maliki is also supported by radical cleric Muqtada al-Sadr. Al-Sadr's followers are committed to a close and cooperative relationship with Iran. At one point, the Iranian government declared al-Sadr as the "emir" (prince) of Iraq and their chosen leader for the country. Al-Sadr is currently in Qom, Iran, studying to become an ayatollah, hoping that the prestigious religious credentials will gain him more credibility and support among Iraq's Shi'a majority. Al-Sadr has not hidden his desire to be the key player in Iraqi politics. 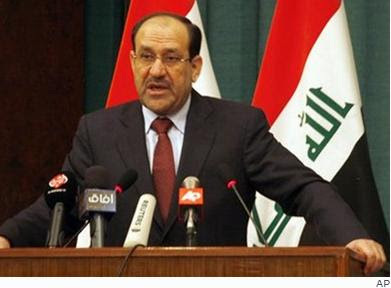 So, with Kurdish and Sadrist support, Nuri al-Maliki will likely continue to be the prime minister of Iraq. It remains to be seen how he handles the Kirkuk situation and if he can convince the Sunnis to cooperate with his government. More critical to American national interests is the amount of influence wielded by Iran externally and the Sadrists internally. Al-Maliki is not a friend of the United States. As long as he is in power, the United States will need to keep one eye on Baghdad and one eye on Tehran.